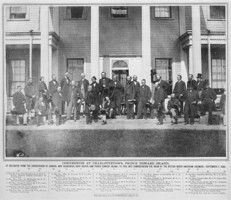 1 Caption: The 1864 Charlottetown meeting about Confederation. 2 Canada's smallest province is Prince Edward Island. It might be small, but it is lovely. The people like to do things their own way. The Island people were used to doing things that way. 3 The first people there were the Micmac. They lived there for more than 2,000 years. They called it "Abegweit." That meant "land cradled in the waves." 4 It must have seemed like that. It is just over 200 km. long and sits in the blue Atlantic. 5 The soil is rich for farming. The ground is not brown; it is red. It is sometimes called "the red island." 6 The French explorers came. Cartier thought the island was beautiful. Champlain named it St. John's Island in 1603. A small French colony lived there for many years. The treaty of Paris gave it to England in 1763. 7 In 1766, the island was divided into 67 plots of land. These were given to men in England. They did not live in P.E.I. but rented out some of it as farms. They were called "absent landlords." 8 In 1799, the island got a new name, Prince Edward Island. Just four years later several Scottish people moved there. They were part of Lord Selkirk's first colony. It was a big success. 9 It was not until 1851 that the people got a responsible government. They could elect those who made the laws.